Well Cole got wind of Desmond's disappearance in the Jeffries FWWM scene so I assume Jeffries appearance at the FBI was a few days after Desmond disappeared. Just found this yesterday-it appears that, in Buckhorn at least, it's somewhere between January 1st 2015 and January 1st, 2016...literally the only visible car registration tag in Parts 1-6....LV, NY, TP, Philadelphia scenes all scrubbed during production to remove any reference to dates....has to be deliberate to be so consistent. I do like the idea that Evil Coop is in 2015 and Dougies world is in 2003...during the house market collapse. Dougies world looks dated so it could be true...but it could be totally wrong. In S3E6 Janey-E referred herself as part of the "99%" during her encounters with the two loan sharks. The '99 percent' was the catch phrase of the Occupy Wall Street movement, which started on September 17, 2011. This puts Dougie's world to sometime between late 2011 and today. 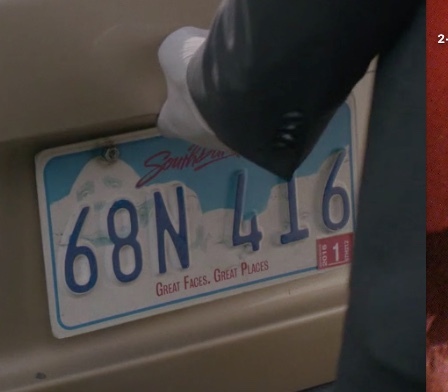 Assuming Dougie's world takes place in the same timeframe as Twin Peaks' world, I assume they all take place 25-26 years after Laura Palmer's murder (allowing for date inconsistencies occurring during S1 &S2), on either 2014 or 2015. The 2003 theory doesn't make sense to me. Bad Coop, having created Dougie Jones, would then have been at liberty to keep an eye on him and have many, many opportunities to kill him. Gordon mentions Jeffries had been gone for damn near two years. So that would make it 1989. Also Jeffries mumbles february 1989 in that scene in the missing pieces. To both explain, and possibly complicate this - the Phillip Jefferies sequence was scripted to take place AFTER the one year time jump. Albert's off screen line "And new from Deer Meadow..." was dubbed in during editing when the scene got shifted to earlier in the film. So, the timeline is correct as scripted, but not necessarily as shown in the film. The events in the Twin Peaks first 2 series took place in March 1989. The first sequence in the film Fire Walk With Me took place in 1988 as it is supposed to be a year before the events in Twin Peaks. In The Secret History of Twin Peaks a memorandum at the beginning states that the archival document may have connection with a crime or series of crimes in 1991. The document was found at a crime scene in July 2016. In Secret History it states that Jeffries disappeared in Buenos Aires in 1987 followed by a reappearance in Philadelphia in 1989. Obviously between the film, TV series and book there are continuity errors. Mark Frost had nothing to do with the film Fire Walk With Me and I think the problem with the continuity is that Mark Frost wrote The Secret History on his own and David Lynch wrote Fire Walk With Me with Robert Engels and so that is why there is no continuity between the dates. You can make it fit by stating that Philip Jefferies disappeared in 1987 reappeared in 1988 in Philadelphia and that the events of the first 2 series of Twin Peaks happened in March 1989 and that the murders in the memorandum relate to the events of 1989 rather than 1991. It seems to me that The Secret History of Twin Peaks itself is riddled with continuity errors anyway. I been wondering about the dates and have come to the conclusion that the film Fire Walk With Me dates correspond with the action in Twin Peaks happening in 1990 rather than 1989 and that Teresa Banks was killed in 1989. That would seem to tie in with the new series being 25 years later in 2015 when they started filming the new series. However, Mark Frost's book combines information from Fire Walk With Me such as Philip Jeffries appearing in February 1989 in Philadelphia with the events happening in Twin Peaks in February/March 1989 when the original series was filmed. The trouble with The Secret History of Twin Peaks is that some things tie up with the series and film and some things don't. I can't remember whether actually in the original series a date is mentioned or not?